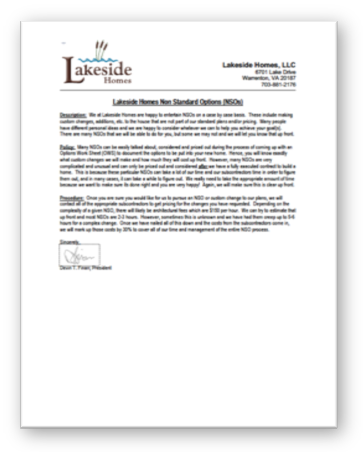 We at Lakeside Homes are happy to entertain Non-Standard Options (NSOs) on a case-by-case basis. These include making custom changes, additions, etc. to the house that are not part of our standard plans and/or pricing. Many people have different personal ideas and we are happy to consider whatever we can to help you achieve your goal(s). There are many NSOs that we will be able to do for you, but some we may not and we will let you know that up front. Many NSOs can be easily talked about, considered and priced out during the process of coming up with an Options Work Sheet (OWS) to document the options to be put into your new home. Hence, you will know exactly what custom changes we will make and how much they will cost up front. However, many NSOs are very complicated and unusual and can only be priced out and considered after we have a fully executed contract to build a home. This is because these particular NSOs can take a lot of our time and our subcontractors time in order to figure them out, and in many cases, it can take a while to figure out. We really need to take the appropriate amount of time because we want to make sure its done right and you are very happy! Again, we will make sure this is clear up front. Once you are sure you would like for us to pursue an NSO or custom change to our plans, we will contact all of the appropriate subcontractors to get pricing for the changes you have requested. Depending on the complexity of a given NSO, there will likely be architectural fees, which are $150 per hour. We can try to estimate that up front and most NSOs are 2-3 hours. However, sometimes this is unknown and we have had them creep up to 5-6 hours for a complex change. Once we have nailed all of this down and the costs from the subcontractors come in, we will mark up those costs by 30% to cover all of our time and management of the entire NSO process. 6701 Lake Drive in Warrenton, Virginia. If you'd like more information on our homes, please contact us. A planned community with lakes and amenities situated near three new schools, just ten minutes from I-66.